Genealogy Serendipity Out of the Blue via Email! A little background information first. In 1999 I started researching the life of Lady Diana Taylour. 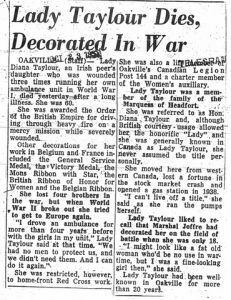 She lived in Oakville from 1936-1957 and someone felt that her grave deserved a flag on Remembrance Day. They couldn’t find the proof required by the Town, could I help. Well I found an obituary that provided the information the Town required. But…It caught my imagination. I couldn’t let this lady go. There was something about the obituary that had me wanting to know more. While I was doing this research on Lady Diana Taylour I had never seen a picture of her. I commented on this in the last post of the series. Well image my surprise last week when on International Women’s Day I opened an email from a lady who was collaterally related to Lady Diana Taylour! She had found my blog posts! In the email she included a picture of Lady Diana Taylour taken in the 1940s. It is hard to make out the year it might be 1943. This is the first time I have ever laid eyes on the lady who captivated my life for so long! She was wearing her khaki green uniform as I had been told by many people she wore constantly. She looked familiar to me and it is how I imagined her to look. I have permission to share the picture here with you so here is the moment when I finally put a face to the Lady Diana Taylour. The story of Lady Diana Taylour is a wonderful adventure. Click here to read part one and here to read part 2. A search of the 1901 England census proved a little confusing at first. Benjamin Taylor was found and he was born in Langham Norfolk. He had a son Edward born in Norfolk but no daughter Kate. His wife is not Kate but Emmeline. There are three new sons Harry, John and Frank. Benjamin and Frank were found in Toronto with Diana. The age difference between Frank and Harry is 7 years. This is the right family because the ever faithful servant Emma Buttle is still with them. A marriage record was found for Emmeline and Benjamin. They married in 1898. 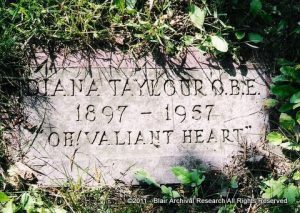 Kate Taylor had died in 1896. She had caught measles while pregnant and as a result of a premature birth and congestion of the lungs she did not survive. Benjamin was known to be in Canada in the 1930s. I have his wife and sons names so did a census search. The 1906 Northwest Canada census was online and indexed at this time. I did not know where in Canada Benjamin was but took a chance because Diana’s obituary said she came from western Canada and Benjamin and Frank were living with her in Toronto. The chance paid off when I found Benjamin and his wife Ree along with his sons John, Harry and Frank in Winnipeg Manitoba. The family arrived in Canada circa 1905. In the 1911 Canada census Benjamin and his family were found in West Kildonan, Selkirk, Manitoba. Since the family was still all together in 1911 a search was done of the First World War Canadian Expeditionary Force attestation papers to see if John and Harry could be found. Harry was with the Cameron Highlanders and John with the Quebec Regiment. Harry came home but John died of influenza in December of 1918. John had been wounded in the shoulder and had several different maladies during his service. Frank was too young to fight. 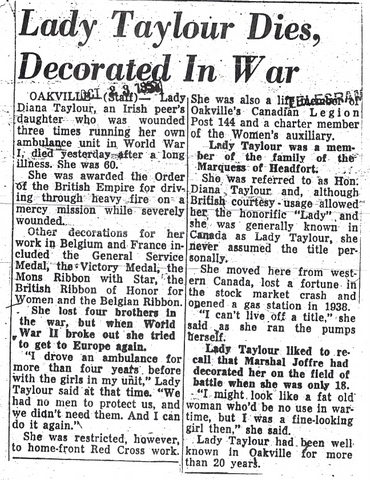 In the meantime I had been going through every Oakville newspaper from 1936 to 1957 to find information. Diana was found advertising her business selling Avon products and giving a donation to the new cenotaph. The papers were checked for each Remembrance Day but no pictures and very few references to the parade were found. She was mentioned twice in the Court Reports once as the prosecution and once as the defence. Diana was accused of not paying someone but was let off when it was noted that she had written paid in full on the final cheque. The other one was far more interesting. 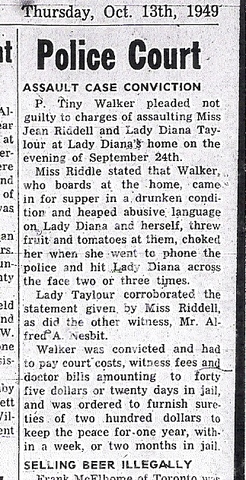 P. Tiny Walker was accused of assaulting Lady Diana Taylour and Jean Riddell. He threw fruit and slapped them. An Archivist at Library and Archives Canada helped me find a reference to the Women’s Legion in the Canadian Forestry Corps records. There were three boxes and a reference was found for a Miss K. Taylor who joined the Corps as part of the Women’s Legion on 14 August 1918 just before the end of the war. I was not sure it was her. Then a reference was found to the drunk driving charge and the Forestry Corps did not seem to make much of it in the documentation. They were more concerned with the license and car numbers being correct. 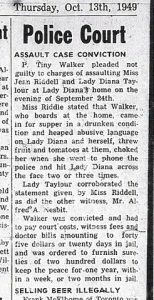 The report of the drunk driving charge is the first time we find Diana calling herself Taylour instead of Taylor and she was recorded as being with the Canadian Forestry Corps. Diana was discharged from the Canadian Forestry Corp in March 1919. More research into the Stone family found that Diana’s maternal aunt married Edward Stone who was also the executor of her grandfather’s estate. When the 1911 England census was released Diana was found in the household of her aunt Annie Stone and is called May Taylor. I finally found her in the 1901 England census. The Stone family was found living in Beckenham Kent. Edward Stone was a director of a drapery company. Diana is again referred to as May Taylor. Diana was found on the passenger lists arriving in Canada. The entry said she was Katherine Taylour, age 30, going to her father in Winnipeg and leaving her aunt in Streatham. She arrived in Quebec on the Montclare on 22 October 1926. After the First World War many women reinvented themselves and created a new life. Two million women were to be forever single and without a family due to the loss of men during the war. 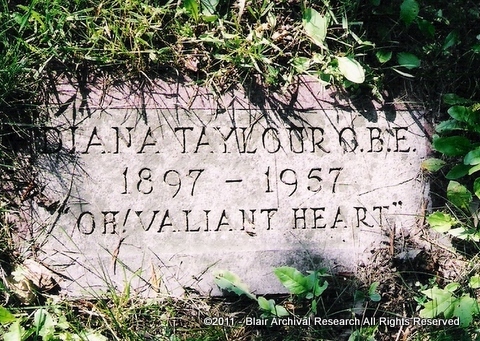 Kate Taylor was one of many women whose personal history was changed by events and themselves. Her new life was actually created from the lives of many who were close to her. She was born Kate May Taylor. Her new name became Katherine Diana May Taylor. It was discovered that her grandmother Bishop was called Diana. The addition of Harwood in the 1940 National Registration Questionnaire is a tribute to her aunt Anne Bishop Stone, Harwood was her middle name. She added a ‘u’ to Taylor and took a peerage family as her own. As for the medals, well she applied for them. They could have come from her brothers. It is not known what happened to Edward Taylor so she may have gotten some from him. She had four brothers, but only two that we know of fought in the war, and she lost one brother at the end of the war. She didn’t drive an ambulance at the front during the war but in Canterbury. Diana did move to Oakville from Western Canada as she was going to Winnipeg in 1926 when she arrived in Canada. As to loosing money in the stock market we will never know. Lady Diana Taylour was not the youngest nurse in the military and did not get a medal from Joffre in the field of battle. Her brother John was wounded in the shoulder during battle but it seems unlikely that Diana was wounded. The story does not end here however. I found a member of Diana’s family. They knew of Diana but they did not know much about her. No picture has been found of Lady Diana Taylour so I still do not know what she looks like. I have been told she was short, stocky and always wore a green khaki uniform probably from her Women’s Legion days. It took ten long years of research and thinking outside the box but I finally found the real story behind the myth of Lady Diana Taylour. I am very glad I followed my instincts as I wouldn’t have missed this ride for anything in the world. NOTE: Do you or anyone you know have any information on Diana’s brother Edward Benjamin Taylor? He was born 18 June 1888 in Mautby and the birth was registered in The Fleggs County Norfolk. If so please contact me as I would love to learn more about him. Solving the Mystery of Lady Diana Taylour – What came next? The story of Lady Diana Taylour is a wonderful adventure. Click here to read part one. Now that an address was known the London city directories were searched. A few of these directories are available at the Toronto Reference Library. The family listed at that address was Stone. The 1901 England census had been released but no references could be found. The Toronto Reference Library has the online searchable databases for the Toronto Daily Star and the Globe and Mail newspapers. A blanket search for Diana Taylour was done to see if anything came up. It did. References were found for Lady Diana and Jean Riddell opening a gas station at Post Corners north of Oakville. My research to date has provided no documentation on this event other than the newspaper article. She was a honourary president at the London Ontario Coronation Unit for Ex British Servicewomen. 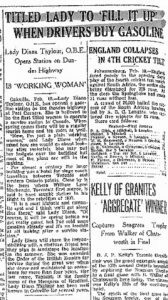 The most interesting item found in the newspapers was an advertisement for a shop she had on Yonge Street. This led me to the Toronto city directories found at the Toronto Reference Library. Diana showed up once in the directories under her business and a home address. A cross reference for Taylor was done for the home address in the directories. 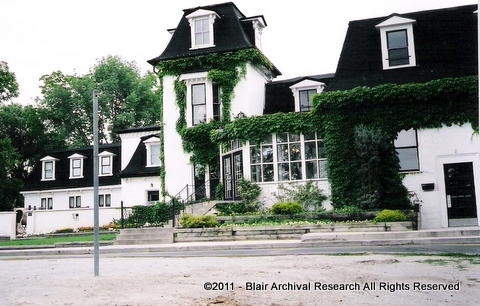 Benjamin who was a superintendent at London Life Insurance and Frank who worked with the Toronto Real Estate Board were found living in the same house as Diana. Who were they? The next things happened almost at the same time. I had ordered a copy of Diana’s 1940 National Registration Questionnaire but was waiting for it as it takes about two months to receive the information. While waiting for the questionnaire an entry was found in the 1891 England census with Benjamin Taylor living in Norfolk with a daughter Kate who was 10 months old. A birth certificate was ordered. It stated she was born Kate May Taylor in 1890 in Weybourne and her parents were Benjamin Taylor and Kate Bishop. The 1891 England census had already given me her mother’s maiden name because her grandmother Ann F. Bishop was living with the family. Also in the household were Diana’s brother Edward B. Taylor and a servant Emma Buttle. A marriage certificate for Benjamin and Kate confirmed Kate’s maiden name was Bishop. Kate’s father was John and Benjamin’s father was William. The 1940 National Registration Questionnaire gave me even more information. Diana still gave her year of birth as 1896 but she gave the right birth date of 28 May. It states that she and her parents were born in Norfolk. Diana added something new to her name; she was now Katherine Diana May Harwood Taylour. The new gem was that she arrived in Canada in 1926. Diana said that she could speak French; ran a private rest home and guest home, was a good cook, qualified mechanic and could drive a fire engine. She could also handle horses, drive – automobiles, trucks and a tractor, and was an organizer of girls. She gave her occupation as U.R.C.W. Hon Pres Coronation Unit 2 London Ontario 1 year duration and nursing home matron 8 years duration. Diana gave more information on her First World War military career. 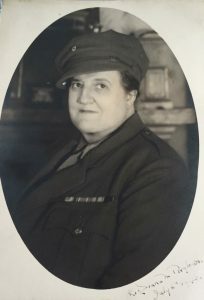 It said in the last war she drove a private ambulance for four and half years and was a column leader of ambulances after the war for eighteen months. She wanted to help in the Second World War by being trained and serving on the home front. Diana said she would like to run training for women and work overseas or home defense. It started off as a simple search to find some information on Lady Diana’s military history but it turned into a ten year search for the truth behind the myth of Lady Diana Taylour. In 1999 I was asked by a friend to find out more information about a grave stone found in the Old Oakville/St. Mary’s cemetery. He felt that because of the inscription on the grave stone that she deserved a flag on Remembrance Day and the town would not do this without proof of her military service. The local paper only provided a basic death notice with no information on her military career. I said I would see what I could find and so started a journey that would take ten years to solve and provided twists and turns that were both frustrating and exhilarating. A trip to the Toronto Reference Library provided the information needed to put a flag on her grave but it also raised more questions that needed answers. A reference was found for Lady Diana Taylour in the Biographies of Canadian Women Index at the Toronto Reference Library. This is an index that can have a lot or a little information. In this case it was a reference to an obituary in the Toronto Telegram newspaper. 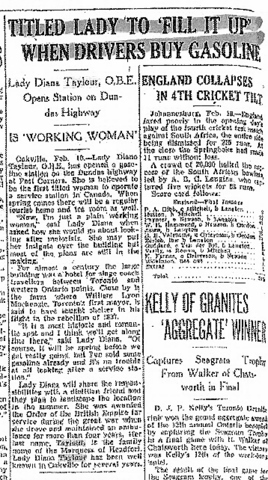 A search of the Biographies of Canadian Women microfilm provided a copy of this obituary. The obituary stated a connection to the Marquess of Headfort’s family so a search was done in “Burke’s Peerage and Gentry” and “Debrett’s Peerage & Baronetage.” She was not mentioned. A relation of the Marquess did live in British Columbia but research provided no link between the family and Diana Taylour. Land records for her property in Oakville were searched. Diana bought the property in December 1936 with a friend Jean Riddell. Diana was listed as a nurse and Jean a dietitian. They went through foreclosure in 1954 but continued to live there until 1957 when a move was planned to Grimsby. Diana died just before they were to move. Jean went through with the move to Grimsby. Since no place of birth was known the birth indexes were searched for Ontario, England, Ireland and Scotland from 1891-1901. There were no Diana Taylour’s and too many Katherine, Kate and May Taylor’s to distinguish which could be the right one. 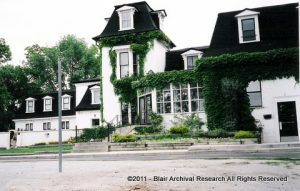 The Oakville Historical Society was approached for information on Diana. Someone had donated a more extensive obituary that was found in the Hamilton Spectator newspaper. I was able to speak to a few people in the community who knew her. They said she walked at the head of the Remembrance Day parade with a chest full of medals. Ran a home for invalid men and if they could not pay she did not care. Diana provided nursing care to people in the community. She drank like a fish and swore like a banshee. She had dogs and a myna bird and was a good conversationalist. Mary Ingham is a researcher who specializes in women, nurses, First World War and suffragettes. She found a war medal index card in the women’s index and sent me a digital copy. The card showed Diana applied for a General Service Medal on 30 June 1919. The address provided was on Kirkstall Road in Streatham. The other research proved inconclusive. The Men’s War Medal Index cards were online so a search was done under Taylour to see if anything could be found on her brothers. Imagine my surprise when a card for Diana showed up! She had not only been in the women’s index but the men’s as well. The card on the men’s index gave me a more detailed look at her war efforts. K.D.N Taylour applied for the British War Medal on 30 June 1919. Theatre of war was home. The Corps listed were Canterbury Private Amb[ulance] Work and Canadian Forestry. The address was Kirkstall Road in Streatham. Since the cards make no reference to her receiving her medals I was told that she probably had not received them.